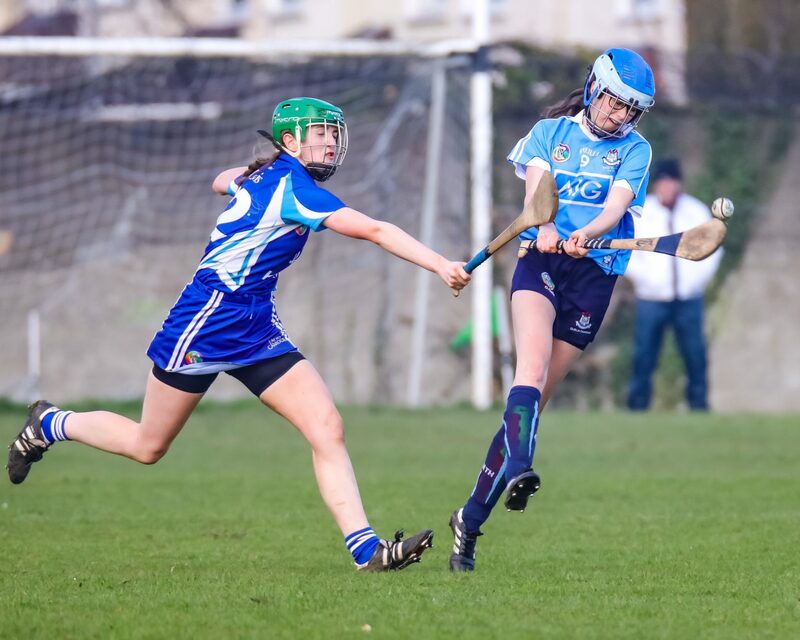 Dublin’s U16B Camogie team scored five goals in their 21 point point win over Laois in St David’s in Artane on Saturday afternoon to reach the Leinster championship final. 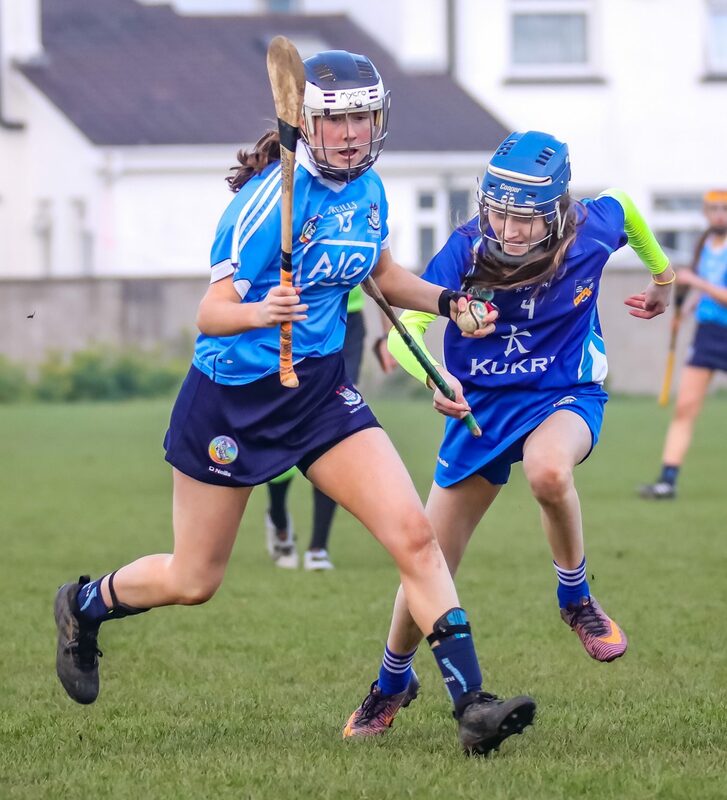 This semi final was all but over by half time as the girls in blue struck for four goals in the first half to race into an 17 point lead by the short whistle. Grainne Skelton was followed two minutes later with the Dubs first green flag of the game from Grace Dent. 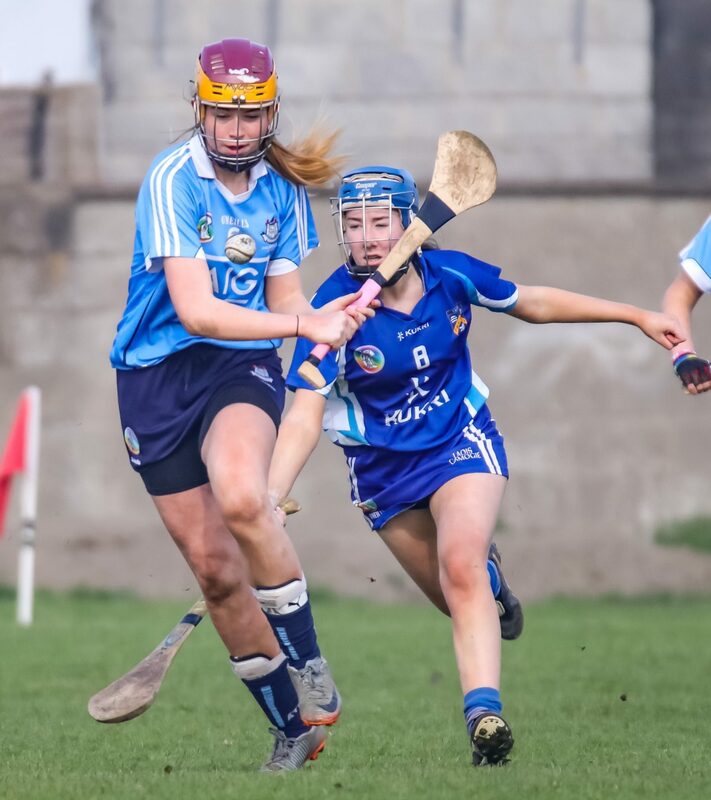 Laois were getting some ball and looked bright going forward but they were constantly running into a well organised Dublin defence well marshalled by centre back Roisin O’Neill Cunningham. In front of Cunningham midfielder Libby Peppard was breaking up attacks and sweeping up any loose ball and putting the girls in blue on the front foot. Between the tenth and twentieth minute the Sky Blues scored an unanswered 2-04. Grace Dent was on fire, she scored a point in the 11th minute and pounced for her second goal of the half a minute later. Laois were at sixes and sevens at the back and Fiona Isdell made them pay with a fine finish for the metropolitans third goal. Dublin kept up the relentless pressure and points from Dent, Hannah Reynolds and Grainne Skelton pushed the lead out to a massive 15 points. Six minutes from the break Laois got their first score of the contest from a converted free by Eireann Cole. But with two minutes to half time Grace Dent completed her hat-trick of goals with another clinical finish. That finished the scoring in the first half and Dublin headed into the break with a commanding lead and almost both feet in the final. Laois could have been forgiven for dropping their heads after the first half onslaught but to their credit they gave it a real go after the break. Enjoying more possession they made it count with a excellent goal from half forward Aoife Carroll that gave them a lift. 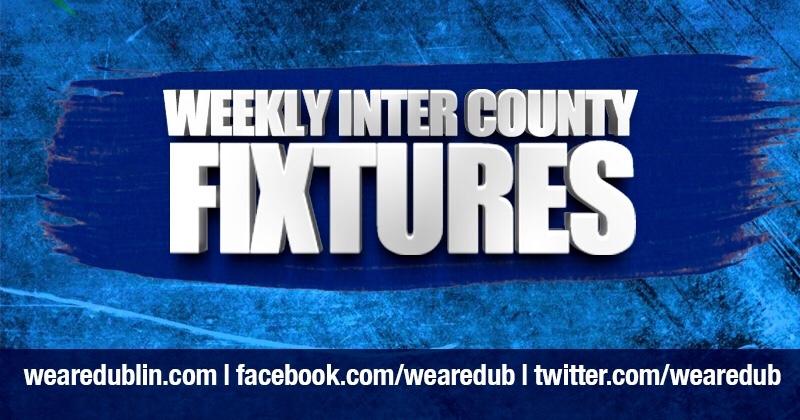 But Dublin weren’t in the mood to facilitate an O’Moore County comeback and scored four points on the bounce. Three points from Grainne Skelton, one from a free, one from open play and the other from a 45’ and a fine point from Julie Grimes stopped the Laois fight back in its tracks. But Laois although on the ropes were not ready for the 10 count and Karla Whelan gave them a glimmer of hope with a quick fire 1-01 in the space of a minute. 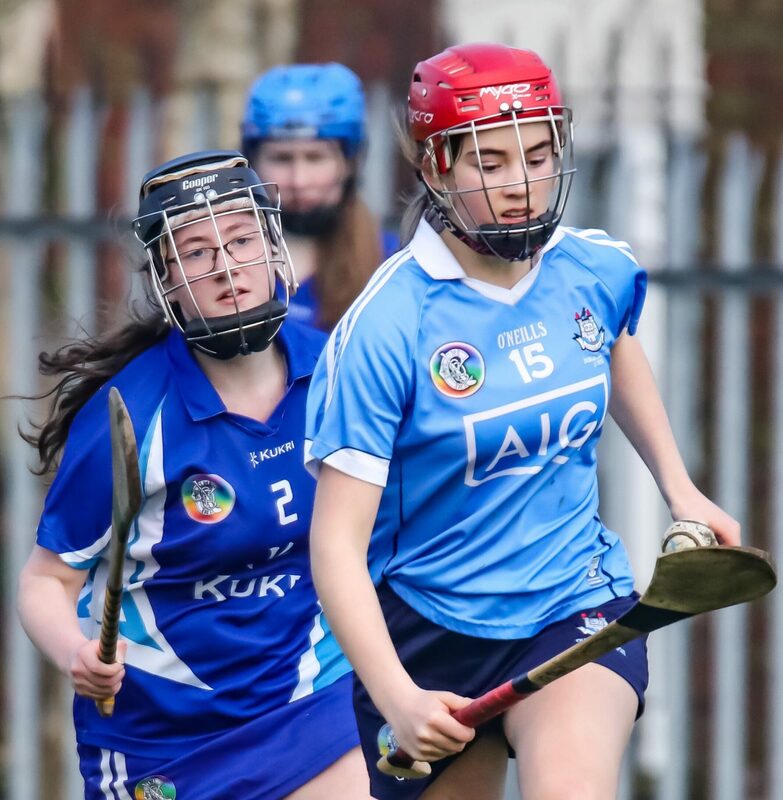 But as they had done from the start of the second half Dublin responded and points from Christine Shanahan and Hannah Reynolds kept Laois at arms length. With four minutes of normal time left Aoife Carroll scored the O’Moore Counties last point and score of the game. 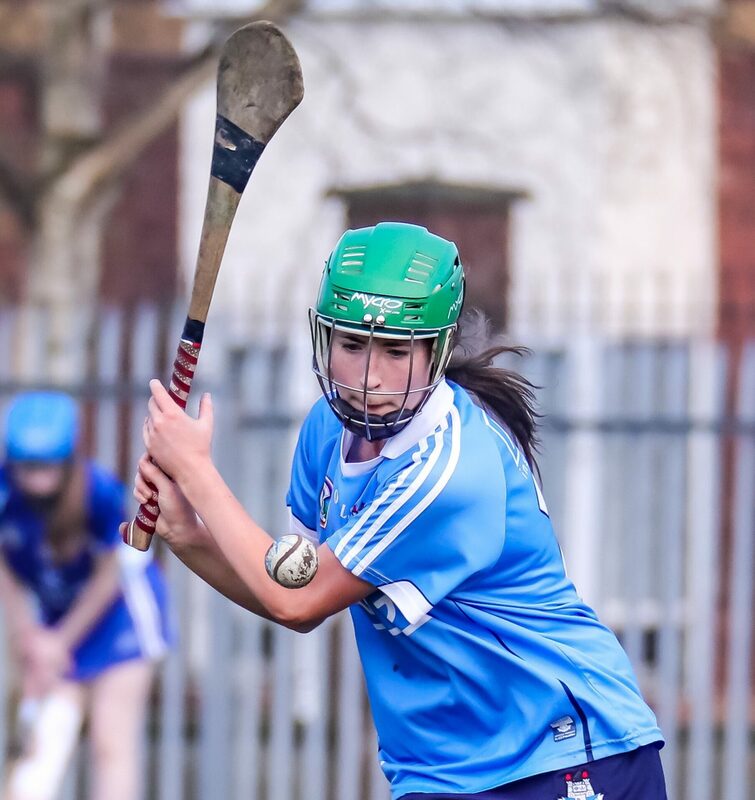 Although time was just up and the game all but over the winning mentality of the Dublin side shone through as they continued to pile forward and added a further 1-03 to their total. 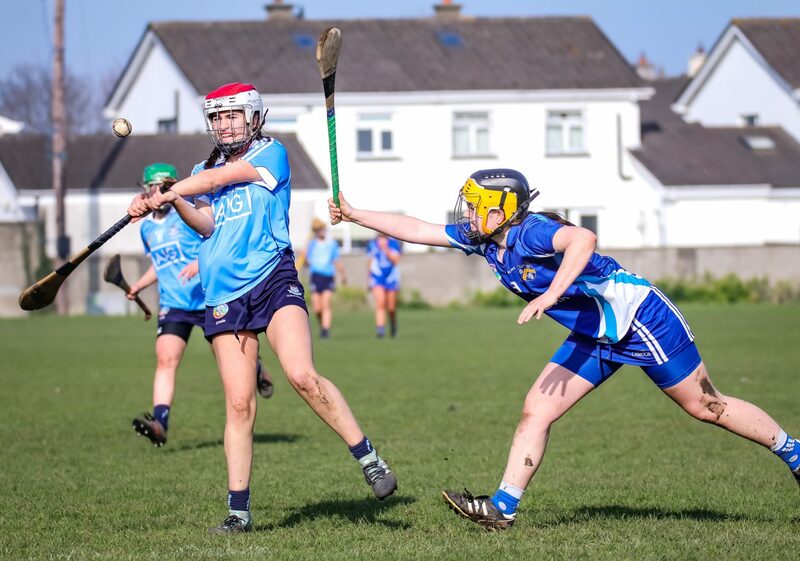 Emily Byrne hit a superb point in the 57th minute, Hannah Reynolds hit a fine effort two minutes later and then grabbed Dublin’s fifth goal of the game in the last minute. She was finished yet and five minutes into added time hit another fine point from play to bring the game to an end. 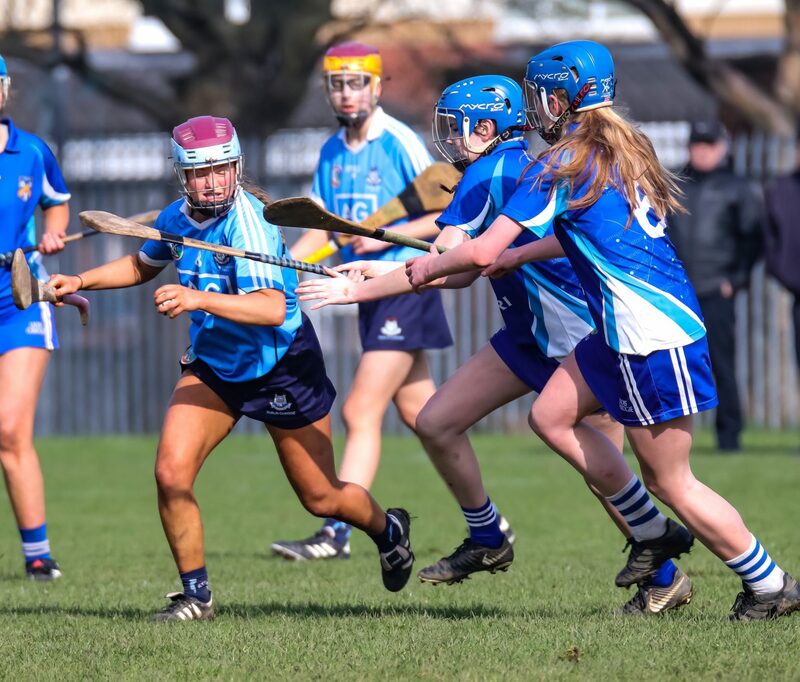 Next up for Dublin is the Leinster Camogie Championship Cup Final on the May bank holiday weekend where they will go toe to toe with Carlow with the venue and throw-in time to be confirmed shortly.